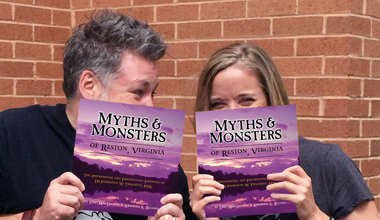 Eric is the creator of Myths & Monsters of Reston, Virginia: The Fantastic and Frightening Findings of Dr. Padraigin W. Thalmeus, PDS. (Great Owl Books, 2016), and creative director of In His Own Words: Stories from the Extraordinary Life of Reston's Founder, Robert E. Simon Jr. (Great Owl Books, 2016). He first moved to Reston in 1970, and lives there with his wife, together enjoying and exploring the nature and wildlife of the area. Kristina is the author of In His Own Words: Stories from the Extraordinary Life of Reston's Founder, Robert E. Simon Jr. (Great Owl Books, 2016), and coauthor of Myths & Monsters of Reston, Virginia: The Fantastic and Frightening Findings of Dr. Padraigin W. Thalmeus, PDS. (Great Owl Books, 2016). She is a lifelong Restonian, photographer, and lover of a well-told story. She lives in Reston with her husband and children and a revolving cast of feline houseguests. Learn more about the Authors at Great Owl Books, and find out about appearances, readings, and book signings there and on Facebook and Twitter.